When founder Anna Magee left the idea for a rehabilitation hospital in her will in the early 20th century, women had just recently earned the right to vote. Career opportunities for women were limited, and many obstacles would remain in their path in the decades that followed. 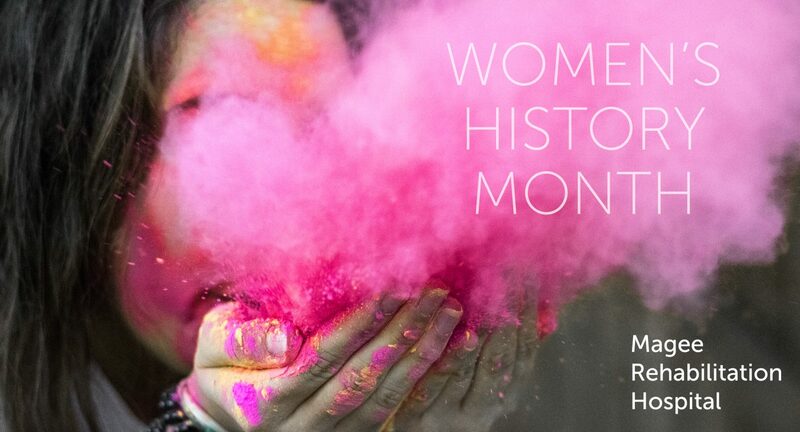 Now, in March of 2018, as we celebrate Women’s History Month, we will recognize just a few of the women in leadership at Magee. What about your work inspires you every day? I love watching people’s passions surface and figuring out how to create environments where we can help them flourish. What do you think is a pressing challenge facing women in the healthcare industry today? Gosh, there are so many pressing challenges in healthcare currently regardless of gender. As far as leadership goes, I’m sure many have heard statements that the healthcare industry is loaded with women, but perhaps not necessarily heavily weighted in C-suite-type positions. That said, in my profession, I feel surrounded by many strong women leaders. I think the challenges are not far removed from some other industries where the landscape is always rapidly changing. We need to work hard to stay relevant, stay current (or ahead of the game actually), know what we need to accomplish, and do it well. If we do that, which is no small task, women should be confident in their abilities and talents and know that they can have a great impact on the future of healthcare. What is your leadership motto? I used this quote in one of the first presentations I ever did on the importance of leadership. I’m not sure if it would be considered a motto, but it has stuck with me ever since and has become a guiding principle of sorts. I think our job as leaders is to be helpful, but that doesn’t mean doing everything for others. It means doing what will be most beneficial for an individual or team to grow. What advice do you have for other women who aspire to leadership positions in healthcare? I would say do not aspire for a “position.” Aspire first to be a leader in whatever role you are in. The rest will follow. I’m constantly inspired by my compassionate and brilliant co-workers. Watching their interactions with the people we serve, and seeing the impact of the work that they do, lifts my heart. Spend your precious time on the things that are important. Being kind is one of those things. Hoping to make a positive difference either directly or indirectly in the lives of the people Magee serves. Balancing work and home and finding limits that can work for individuals so they don’t become overwhelmed. We do all that we can to make the best decisions with the information we have available. Stay strong, don’t take too much personally, and just be sure you gather as much information as you can before making decisions. Sometimes, I think for all of us–women and men–we can be our own worst enemies. I face that challenge by coming to work every day and doing the best job that I can do for those I have the honor to work with as well as for my own professional growth. I think those women aspiring to leadership positions should value honesty, integrity, and perseverance. Women should not be afraid of a little “creative abrasion,” so to speak. If you’re ever in a position to choose your team, choose people who don’t think like you. It brings about new ideas and solutions.